Zita is a highly customizable multipurpose WordPress theme that manages to remain extremely user-friendly. This free theme includes 8 unique header layouts as well as 8 footer widget layouts. With the customization options available, you can build a website that is with a look that is perfect for you. 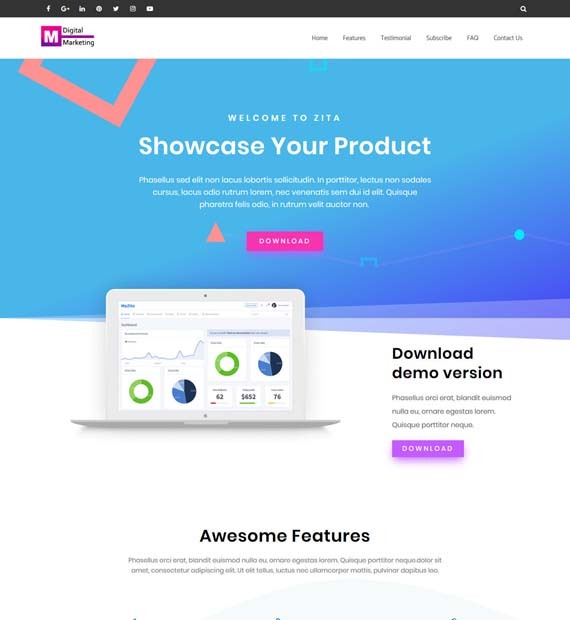 To top it all off, Zita also comes with a WooCommerce integration, full responsiveness, and translation support, not to mention compatibility with the major page builders. Change almost everything and transform the look and feel of your website easily. Easy to configure theme options and settings enable you to design to your heart’s content. Build web pages that detect the visitor’s screen size and the device’s orientation and change the layout accordingly when the users visit your website. A WordPress beginner? No worries. You can simply confugure and customize the theme without touching any code – feel the simplicity and highly intuitive interface like never before. Speed matters! Build a blazing fast website with this lightweight theme – built with minimal and clean code that is free from clutter & mess. Serve your site users faster & make them happier. Developed by professionals using clean and validated code that humans as well as search engine bots love. Compatible with Yoast or All in One SEO or other SEO plugins for more SEO features. Import the beautifully designed website templates with a single click and start customizing. It’s the fastest way to have a website with a fine-tuned design and maximum theme possibilities used. Choose from the set of multiple header and footer styles. Pick, mix, match, and build a website like you always wanted. Customize the background of your entire website – change the background color or background image in just a few steps and build your brand website. Explore the limitless freedom of web design with unlimited colors. Customize almost all areas of your website with your favorite colors and create sparkling a webpage.